ISSUES: Oxided blades, missing bail. ADDITIONAL INFORMATION: Engraved R.S. Kinnaird on mark side. Engraved Hitting 500 For February 1917 on pile side. Brown leather carrying pouch. 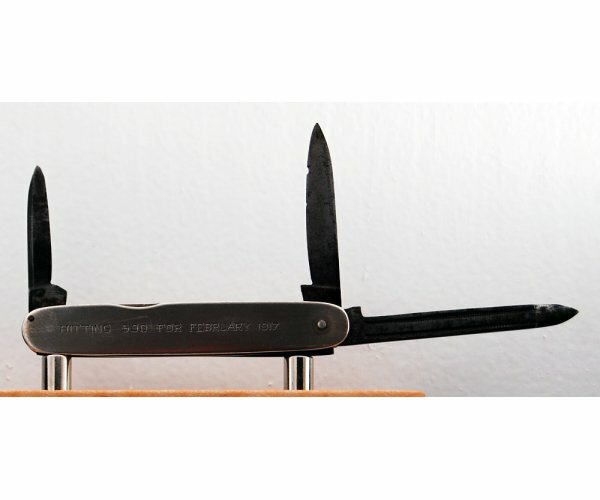 Near Mint: There must be nothing wrong with a near mint knife. It should “walk and talk” and must have most of the original polish visible on the blades. Very light sharpening would be acceptable, but the blades must be full. It can have some light rust spots, but no deep rust pits. Some light carry scratches are permitted on the outside as well. Excellent: Knives in this condition would include solid, lightly used knives. There may be a bit of blade wear (no more than 10%). Some tarnish and light pitting would be acceptable. Blades should snap well, and the tang mark should be clear. 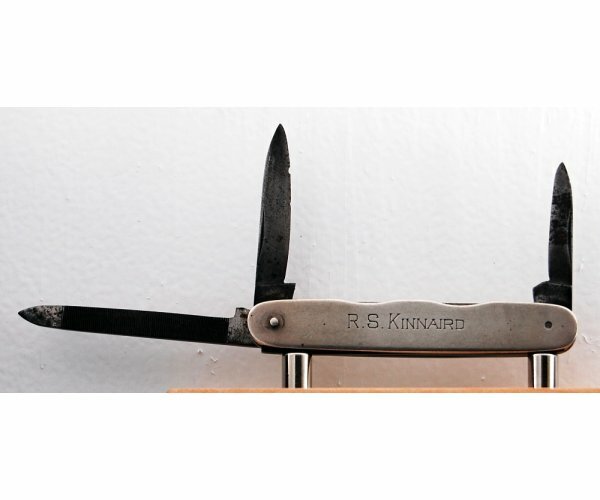 Very Good: Knives in this condition are generally well used knives. There may be blade wear of up to 25%. The blades should still be sound, but one or more may be slow. The stamping should be readable but may be faint. The handles may have cracks and wear but shouldn’t have major chipping. The knife might also have some rust pitting and tarnish. Good: Knives in good condition must still be useable as a working knife. Blade wear may be between 25-50%. There might be chips in the handle or blade. Blades may be slow with deep pits and rust. You should still be able to make out the maker of the knife by shield or tang stamp. Please use the Contact Us link if you have any questions. The knife will be shipped in a box and not an envelope via USPS First Class Mail and a tracking number will be provided. This pocket knife comes from an adult smoke-free home and is described to the best of my ability. Please take a good look at the pictures as they are a large part of the description. Additional pictures are always available, just ask what you’d like to see, and I’ll make them available. All sales are final, and returns are not permitted for this pocket knife unless it has been grossly misrepresented. In purchasing, you attest that you are of legal age and can legally possess this knife. Thank you for looking at my pocket knives and your kind consideration towards an offer or a purchase. If this item is purchased with another item from Cosgrove Cutlery that has a shipping cost of $5.00 or more, standard shipping to US addresses for this item will be discounted to $1.00.